Without doubt, the best and most restful and stress-free vacation, is to book a cruise on a fully crewed yacht, where the boat is exclusively yours for the duration. The vessel can be sail or power, and the crew will navigate, sail and prepare the beverages and meals. This is definitely the lap of luxury or as the Irish say: “Living the life of Riley”.. the whole boat is yours to go wherever you like, your crew will be responsible for serving you three meals a day plus preparing the many exotic or traditional island beverages and magnificent gourmet dishes for your evening meals. The chefs on board luxury yachts pride themselves in the quality and variety of their meals; (Some of these crews are husband and wife teams, others have less or no personal relationship). This truly remarkable vacation has no equal on earth: sailing on your own private yacht with an attentive and knowledgeable crew to attend to your every need has to be the ultimate experience. 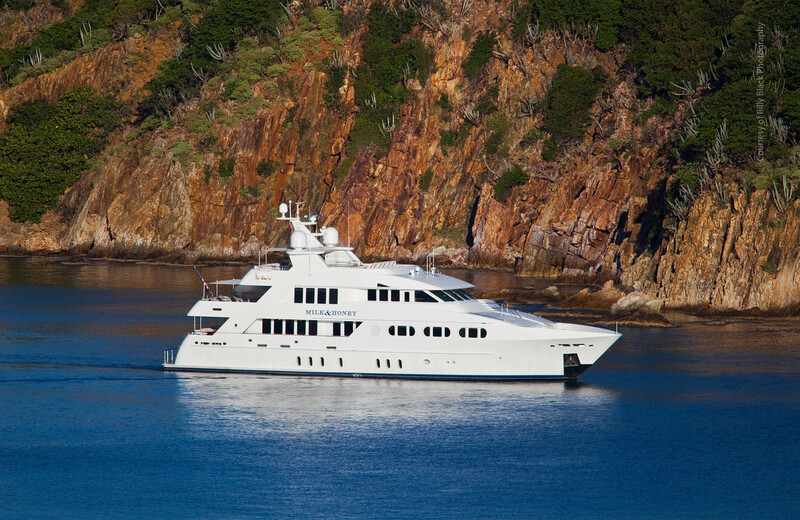 You can view a short list of our finest crewed yachts, both power and sail, or go to our state-of-the-art crewed yacht search engine. Please take the time to examine the difference between different contract terms for fully crewed yachts on our separate page. The second way and if you have the necessary skills, charter a bare-boat without captain or crew. 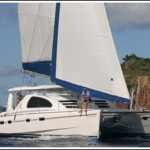 Under this arrangement you and sailing catamaran your party will be the captain and crew. Of course, some prior experience will be necessary for your own safety, and you and/or your guests will be required to fill out a form known as a sailing resume, take out accident insurance and/or provide a security deposit before the Charter Company turns you loose. The third way to charter is with a captain-only or skippered yacht arrangement under which the charter company or yacht owner provides a qualified captain, usually a person expressly chosen not only for their nautical experience but more importantly for their people-skills and ability to interact socially with a wide variety of guests.You and your party will be expected to do the meal preparation or to eat ashore at the many available local restaurants and watering holes on the different islands. You will be responsible for the captain’s meals as well. Many of the bareboats on our site are also available with an experienced captain. 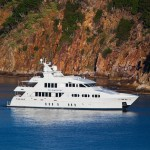 Also, some of the fully crewed yachts can be chartered as “captain-only” vessels. Sailing with kids? Some of my clients who are parents of younger kids, pre-teens and teenagers often express reservations about taking the kids on charter: “it would be a nice relaxing vacation for us but what will the kids do?” Other times it’s the kids themselves who express the age old: “how boring can you get, that’s for old people” or “can I stay in touch with my friends on Facebook?” or “Do they have Video Games or Movies on board?” Of course, it is a family vacation and everyone should have a great time, not just the parents. Trip cancellation insurance is highly recommended for trips that are booked far in advance of the charter date. Our company directly accesses the major industry trip insurance provider to provide customers with instant quotes for use throughout the British and American Virgin Islands and the whole of the Caribbean.